Gaigalas, A. & Satkunas, J. (1994a). Evolution of the Quaternary Stratigraphic Scheme in Lithuania. Geologija, 17, 152-158. Guobytė, R. (2004). A brief outline of the Quaternary of Lithuania and the history of its investigation. In: Ehlers, J. & Gibbard, P.L (eds), Quaternary Glaciations – Extent and Chronology, Part I: Europe. Amsterdam, Elsevier, 245-250. Guobytė, R., Satkūnas, J. (2011). Pleistocene Glaciations in Lithuania. In: Quaternary Glaciations – Extent and Chronology: A Closer Look. 231-246: iliustr. – Bibliogr. : 245-246. Kondratienė, O. (1993). Catalogue of Quaternary stratotypes of the Baltic region. Vilnius, 55 pp (in Russian). Kondratienė, O. (1996). 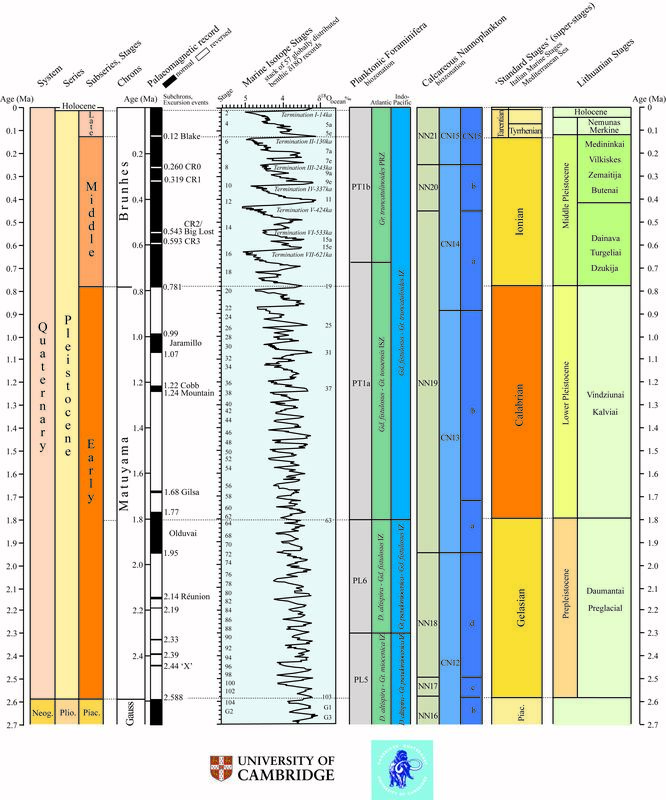 Stratigrafia i paleogeografia kvartera Litvy po paleobotanycheskym dannym. Academia, Vilnius, 212 pp (in Russian). Kondratienė, O. & Bitinas, A. (1989). Stratigraphy and Palaeogeography of the Middle and Lower Pleistocene of the southern Baltics in view of palaeobotanical data. In: Quaternary Age: Palaeontology and Archaeology. Kishinev, 103–110 (in Russian). Kondratienė, 0. & Satkūnas, J. (1993). Stratigraphy of Early Pleistocene of Lithuania. 2nd Baltic Stratigraphic Conference, May 11-14, Vilnius. Abstracts, 47. Satkūnas, J. (1998). The oldest Quaternary in Lithuania. Mededelingen Nederlands Instituut voor Toegepaste Geowetenschappen TNO, 60, 293–304. Satkūnas, J. & Bitinas, A. (1994). The lithological composition of Saalian tills in Lithuania as a criterion for lithostratigraphical subdivision. Acta Geographica Lodzienska, 68, 173-180. Satkūnas, J. & Molodkov, A. (2005). Middle Pleistocene stratigraphy in the light of data from the Vilkiskes site, eastern Lithuania. Polish Geological Institute Special Papers, 16, 94-102. Vaitiekūnas, P. (1968). Problems of Stratigraphy of the Neopleistocene in Lithuania. Kwartalnik Geologiczny T 12, No. 3, 646–664 (in Polish).